A TRADITIONAL CHAKRA BALANCING – adjusts the energy of each Chakra to be in accord with the others. But it gives little consideration to the overall tuning of the entire bio-system. In this sense, you have a Chakra balancing intended for the system that appears balanced to itself but it is still improperly tuned to the orchestra of life. PILLAR OF LIGHT’S CHAKRA BALANCING and TUNING MEANS – adjusting the electromagnetic resonant frequency of ALL Chakras to be in direct Octave Resonance with the Schumann Frequency of the Earth. Thus, they are also properly tuned with respect to each other since each higher chakra is an octave or a doubling in frequency of the one below it. When the chakras are properly balanced and tuned electromagnetically; (i.e. energy entrained) they are in an optimal state to then use their innate wisdom to regulate and maintain the body with all its proper physical vibration rates. When your EM field is maintained, your entire holistic presence is more receptive to your divine essence wisdom. CHAKRAS ARE – regulating vortexual, electromagnetic centers of our auric body and physical body. They are also ganglionic nodes that channel energy and information throughout the body. Tune and harmonize the chakras with electromagnetic resonance chakra balancing from the conductive crystal wands of the Violet Ray Crystal Resonator and the harmonizing chakras in turn, will regulate your entire bodies health with their stable and strengthened Electromagnetic Shield. They bathe every cell in the most healthful and natural EM environment possible. So the Electro Magnetic Fields of the chakras support each cell to vibrate at its divine physical frequency. In this way, there is no need to treat the over 200 different types of cells of our body with its own resonant, physical vibration. The properly balanced and tuned EM vibration of each chakra center supports each cell to access its own innate wisdom. Why treat a symptom when you can treat the cause? Don’t underestimate the power and intelligence of the body to heal itself when it’s relieved of too much stress, properly tuned by a full chakra balancing with the VRCR and freed from the electromagnetic pollution of human technology. The Violet Ray Crystal Resonator has 16 frequency settings; one for each Chakra. The VRCR provides an updated 16 Chakra Balancing and Tuning process that has very specific Earth Friendly Frequencies. It is this tuning and balancing that helps us to overcome unhealthful man made electromagnetism and enables us to heal ourselves and move into higher awareness unimpeded by disruptive forces. This is a globally uplifting time with more people becoming aware of their energy body in addition to their physical body. Maps of the human energy system date back thousands of years and human nature, being what it is, has precipitated many changes, versions and additions to those maps. Some changes may be due to increased understanding of the human energy system or perhaps evolutionary, spiritual changes in the system itself. No doubt, people tend to see things “their” way and so create differences of opinion about the matter. It is good to remember that a map is just a “sign post” pointing towards the truth and is not a truth itself. These maps give location, purpose and other detailed information about certain focal points of energy called “Chakras” or “Power Centers” within the human energy system. Aspects of a persons well being can be attributed to the operating conditions of their Chakra Centers. All aspects of Mental, Emotional, Spiritual and Physical relate to the Chakras in one way or another. Chakra balancing then, is both a preventative and holistic healing procedure that can be performed by many modalities with varying degrees of success. of the body and for the most part, is considered valid even today. Other maps have added more Chakras to the “major” list with a widely accepted number currently being 12. The human energy map that Pillar of Light and the Violet Ray Crystal Resonator uses is based on 16 Major Chakras and is what the Violet Ray Crystal Resonator is specifically tuned and adjusted to for its chakra balancing procedures. Humanity has evolved and moved forward constantly immersed in the Electromagnetic Energy Field of the Earth. Our own energy is really a subset of the Earth and should be in complete resonance. This 16 Chakra system recognizes this alignment of natural resonance with Earth Energy and is believed to be the closest representation of truth pertaining to our energy bodies that we have to date. This 16 Chakra system came into being through several different yet overlapping channels of information; tangible and seemingly intangible, old and new. The foundation has its beginnings with the popular system from Charles Fillmore. Awareness of 4 Additional Chakras comes to be. 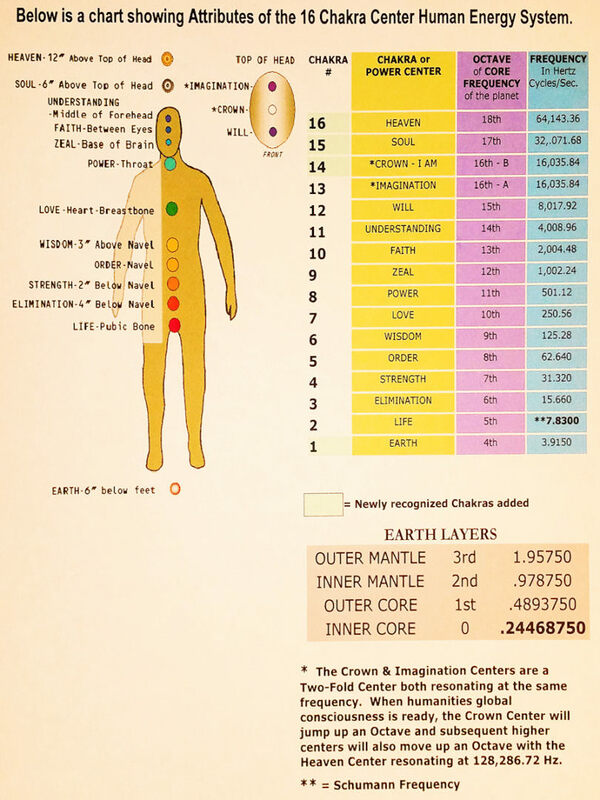 By measuring 1,000s of peoples Chakras both scientifically and Intuitively and by providing many chakra balancing sessions, Jack’s guidance and experiences suggested that an upgrade to this 12 Chakra system was due in a spiritual evolutionary sense and so he was given the awareness of 4 more Power Centers or Chakras. Note: These centers were always there awaiting to be recognized, balanced, tuned and more consciously used. The EARTH CHAKRA – is initiated 6″ below the feet. The conscious activation, balancing and tuning of this Chakra gives even very spiritually connected people the stabilizing connection to Earth Energy necessary for living a balanced physical life. It gave the feeling of being more “rooted” or “grounded” to Mother Earth. Being grounded is very essential. Those working only out of their spiritual centers are disconnected from the Earth, and many times are not able to be effective. By having the Earth Center tuned in harmony with our Creator, it allows the Divine Energy to flow all the way through our body to the core center of the planet, which then pulses it back up through us to the Heaven Center. These energies, move up and down the Chakras and meet in the Solar Plexus, which is our Wisdom Center. This flow occurs in the shape of a figure eight, known as the infinity symbol. The CROWN or I AM CHAKRA – came into recognition as the second element of what Charles Filmore labeled the “Imagination” Chakra. Jack discovered that it had a two-fold essence where the “I Am” center or “Christ Consciousness” Center would receive information and send it on to the “Imagination” Chakra where a myriad of interpretations of the Christ Awareness would take place. The “I Am” Chakra is at the very top of the head. The “Imagination” Chakra is 3 inches behind the “I AM” Chakra. Where as the “Will” Chakra is 3 inches in front of the “I Am” Chakra. The SOUL CHAKRA – was recognized as the next higher step of connection to God Awareness as measured and seen by gifted spiritualists to be located 6 inches above the top of the head. The HEAVEN CHAKRA – came into recognition as the final step towards receiving direct, God Awareness and was measured and seen to be located 12 inches above the head. We are not implying that this is the Center of the Godhead. It pertains specifically to our own, personal Aura. This is the spot that, when tuned properly to the Heaven Center Frequency through the Violet Ray Crystal Resonator, acts like an antenna to recieve Divine, God Energy. Through Divine Guidance, Jack is given the number .24468750 (as the Frequency in Hz.) of the Electromagnetic Pulse of the Inner Core of the Earth upon which everything was to be based. NOTE – This was the first hint of knowledge about the “Schumann Frequency” that would come later. Jack had reached the understanding that a proper chakra balancing was for the 16 Chakras that needed to be tuned and balanced in relationship with each other and he was then given, through divine guidance, the number stated above on which everything was to be based. The entire 16 Chakra Center System was intended to vibrate at direct Octaves of this number. An octave is a doubling of the original frequency. Science knew nothing of the frequency of the Earth’s Inner Core and still doesn’t. Since 1952, science has measured a frequency named the Schumann Frequency that is the Electromagnetic Pulse between the Earth and the Ionosphere. This is actually a set of frequencies of which the strongest and fundamental is measured at 7.83Hz. – with only small variations due to changes in global temperature, night/day effects of the sun and perhaps the number of lightning strikes on the planet in any given second effecting the amplitude of the Schumann Resonant Frequencies. There are roughly 100 lightning strikes per second globally with a typical current flow of 20,000 Amperes. That comes to 2 million amps/second! That is a lot of energy. But the overall energy of the Schumann Resonance is 4 to 6 orders smaller than other electrostatic forces in the atmosphere. It is really a very small but important energy field for our health that is often overwhelmed by man made electromagnetic waves and frequencies. Some estimate the Schumann Resonance energy may be 200 to 300 million times less than the man made electromagnetic energy that is found in the typical American living room. Some also say that man made electromagnetism, for that same reason, may be the single most important threat to human health on the planet. each an Octave or doubling from the core on out. The Inner Core resonates at 0.2446875 Hz. The Outer Core resonates at 0.4893750 Hz. The Inner Mantle resonates at 0.9787500 Hz. The Outer Mantle resonates at 1.9575000 Hz. Earth’s Crust resonates at 3.9150000 Hz. NOTE – It is important to note that Jack knew nothing of the Schumann Frequency then and it’s direct correspondence to being the 5th Octave of the Earth’s Core Frequency he was originally given. This discovery served as a major confirmation pointing to the truth and validation of all the information he’d received about the proper tuning and balancing of the 16 Chakra Center System of the human energy field. Just like the Earth, each Chakra of the human energy system doubles in frequency from the Chakra below it when properly tuned and balanced . This follows the laws of resonance. Starting at our “Earth” Chakra frequency of 3.9150Hz. (rounded to 4) all the way through the 16th “Heaven” Chakra, each chakra doubles in Frequency – meaning that it is a resonant Octave of the one below. There is one exception. The “Imagination” and “I Am” Chakra are both currently resonating at 16,035.84Hz. because of their two-fold nature. 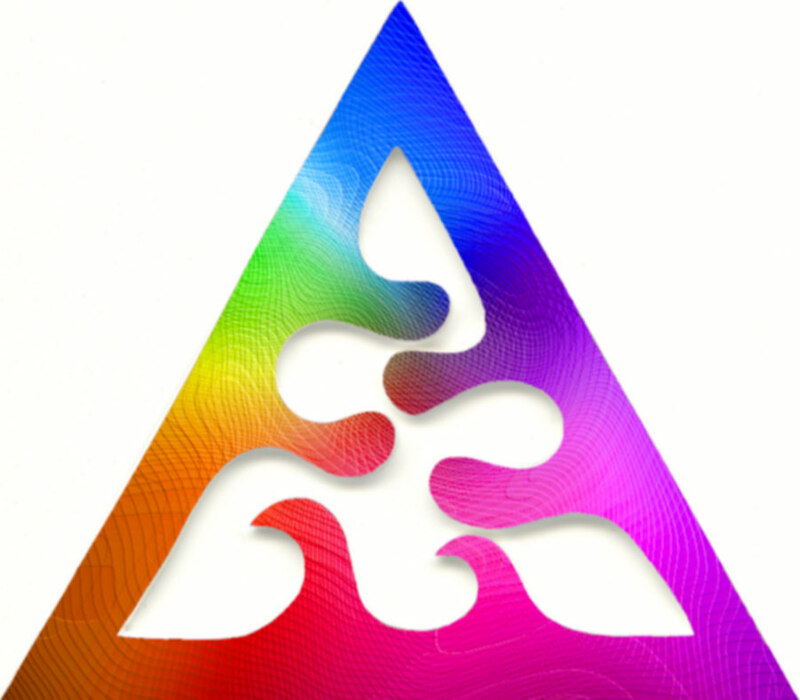 Jack was told that in future time, when human global consciousness has advanced, that the “I Am” Chakra would jump to its expected doubling of the “Imagination” Chakra – bringing it to 32,071.68Hz. and pushing up the subsequent chakras and finally, onto the 16th “Heaven” Chakra frequency up to 128,286.72Hz. It currently resonates at 64,143.36Hz. The human body is similar to the Earth in that it also has an electromagnetic field that operates in resonance with the Earth unless pulled out of resonance – mostly by man made electromagnetic fields not in tune with the Earth. Remember, the Earth’s Schumann Resonance energy is quite weak compared to the man made energies that most of us currently live amongst. The human electromagnetic energy is likened to a DC pulsed current or half wave AC current. Where as pure universal god consciousness energy is more like full wave AC current. To receive and “let in” these energies, our higher chakras translate (metaphorically speaking) god energies from AC into pulsed DC in a step down process. In other terminology, this is working with the quantum entangled Information Field that is the orgainzing intelligence behind all vibration. See the TRIAD picture and explanation below. The Violet Ray Crystal Resonator has 16 defined frequency settings; one for each Chakra. The VRCR is for helping the Chakras to tune and balance to very specific Earth Friendly Frequencies. The VRCR enables us to heal ourselves and move into higher awareness – unimpeded by disruptive forces. 16 Chakra Center Human Energy System. The Triad symbol atop the Violet Ray Crystal Resonator is part of an informational antenna reception/transmit system that performs this information translation mentioned above. It was a symbol worn by ancient cultures to help translate more god energy and information into realms of vibration that can be better received and understood by the human cosciousness. This is only 1 of many processes or vectors that go into the VRCR which optimize and fine tune chakra balancing.